MAL Contends . . .: Prosecute U.S. Atty Biskupic under Federal Criminal Code? Prosecute U.S. Atty Biskupic under Federal Criminal Code? 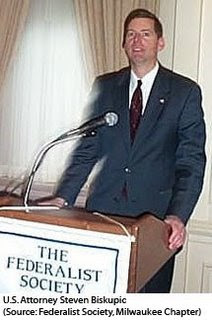 The conduct of Stephen Biskupic, United States Attorney for the Eastern District of Wisconsin (2002 - present) has generated two prominent reactions. “Granted, the prosecution of Thompson, the purchasing official in the Doyle Administration, was a bust. Being a political creature like Thompson, it turns out, is not a crime." Admiration of prosecutors destroying the lives of innocents is far from universal. I am even angrier! In addition to prosecuting and imprisoning an innocent woman, I see he also prosecuted a veteran for trying to get the benefits he is entitled to. So the government can take the services of people who volunteer for military services and then discard them like cannon fodder, subject them to a politically inspired show trial in the manner of Stalin's Russia and Hitler's Germany, frame them up and imprison them. And what about all those indictments for voter fraud? How many are innocent citizens imprisoned for exercising their right to vote. And since the Bush Administration was trying to suppress the minority vote, how many were minorities, framed up and imprisoned for voting as if they lived in a southern county presided over by some ignorant, red neck, cracker sheriff? Biskupic is hardly alone in his using the U.S. Attorney’s office for political prosecutions and retaliation against perceived domestic enemies. The abuse of the Bush Department of Justice to settle political scores and further rightwing ideology is pervasive. Many Americans have been asking the questions: Is this legal? Can’t we prosecute the prosecutors who have corrupted the judicial process and ruined the lives of innocents? Scott Horton, a human rights attorney and columnist for Harper’s, has a column today suggestive of a possible answer to these questions. As the countdown begins to the end of the Bush Administration, abuse of the criminal justice system is finally coming into focus. At this point it is plain that the Justice Department is not guided by policies and principles in its posture, but by an earnest resolve to keep hidden the dark truths that an entire nation now suspects and which will come to the front burner as soon as the results of the Department’s own investigation into the misconduct of Attorney General Gonzales become public. It’s time to shine a bright and sanitizing light down the crevice of these prosecutions and let the truth be known. Horton recommends that a remedy in the U.S. Code for the situation inflicted on the nation by the DoJ be examined for possible future prosecution by a non-Bush U.S. Department of Justice. “Now as it turns out, using the office of U.S. attorney to wage a political vendetta is a crime under sections 1505 and 1512 of the (federal) Criminal Code,” writes Horton. Horton refers to TITLE 18, PART I, CHAPTER 73, § 1505 and TITLE 18, PART I, CHAPTER 73, § 1512 of the U.S. Code in discussing the political prosecution of a prominent Democrat by DoJ Republicans. related to (his) Post Traumatic Stress Disorder (PTSD) diagnosed as occurring because he witnessed and tried to prevent his friend from being crushed to death by a C-54 airplane while stationed at a Naval air base in Naples, Italy 1969, and unrelated assault by the Navy Shore Patrol—granted and then denied, has not yet been decided by the CAVC (U.S. Court of Appeals for Veterans Claims). But the Department of Veterans Affairs (VA) after being accused of fraud in 2003 by Roberts ignored the CAVC process and investigated and asked that Roberts be prosecuted for fraud by the US Attorney’s office. Section 1505 reads in part: “…Whoever corruptly, or by threats or force, or by any threatening letter or communication influences, obstructs, or impedes or endeavors to influence, obstruct, or impede the due and proper administration of the law under which any pending proceeding is being had before any department or agency of the United States ...,” describing a criminal activity consonant with Biskupic's conduct. A future prosecution would have to make the case that the U.S. Dept of Veterans Affairs (VA) and U.S. Atty Biskupic corruptly obstructed the VA's proceeding of the Roberts' appeal for VA disability benefits. That should not be exceedingly difficult as there exists at least a prima facie case that this is precisely what did happen to the Wisconsin Navy veteran, Roberts. See Top VA Officials Plotted to Indict Vet in Violation of Federal VA Rules. The Georgia Thompson and “voter fraud” cases present more clear cases of political corruption. And the Roberts case exhibits a crony's tendency to back the then-head of Bush's VA goal of obstructing vets diagnosed with PTSD. Let's hope that for the sake of justice that all of these cases are examined thoroughly by the DoJ's Office of Professional Responsibility, the DoJ Inspector General, and the appropriate congressional committees (now being stonewalled) overseeing the judiciary. Wisconsin citizens deserve and justice demands full confidence in the impartial, politics-free United States Attorney's offices. One cannot realistically expect results from the Bush DoJ, but a public-interest organization, or a pro bono research project flushing out and constructing a hypothetical criminal case under sections 1505 and 1512 begun by a law firm or law school students offers the hope in the restoration of the travesty of justice that today's U.S. Dept of Justice has become. Prosecutorial Immunity, as Erwin Chemerinsky writes, is not absolute. See also Johns, Margaret Z in Reconsidering Absolute Prosecutorial Immunity.